The NZDUSD sold-off sharply which came as a combination of New Zealand Dollar weakness with strength in the US Dollar. A better than expected NFP report boosted the US currency which fueled the sell-off in the NZDUSD. As the effects of the NFP enthusiasm wore off the Reserve Bank of New Zealand surprised forex traders with a cut in interest rates down to 3.25% which was unexpected by market participants. This currency pair has dropped from its resistance area, visible in light grey in the above H4 chart, to its support area which is marked in light blue. The Bollinger Band indicator support the downtrend, but forex traders may decide to take profits after a strong sell-off and close their short positions. This can lead to a short-covering rally which will propel the NZDUSD. Price action is trading between the lower band and the middle band of its Bollinger Band Indicator and a breakout above the middle band will shift momentum. Forex traders are advised to enter long positions in the NZDUSD at 0.6975 and below in order to be able to profit from the pending short-covering rally. Conservative traders may wish to await the breakout above the middle band of its Bollinger Band indicator. A take profit target of 0.7390 has been set for a potential trading profit of 415 pips on the H4 Chart. More buy orders are expected once the expected breakout occurs. 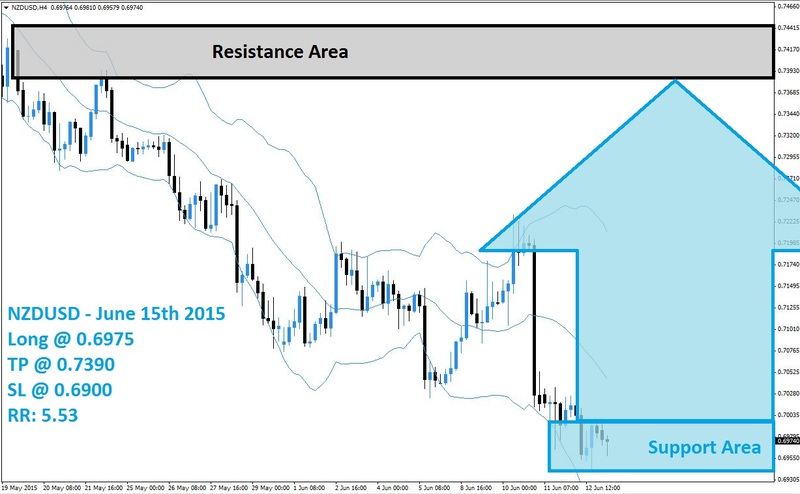 Forex traders should protect this trade with a stop loss level at 0.6900 for a potential trading loss of 75 pips which will result in a Risk-Reward (RR) ratio of 5.53. EURUSD and AUDUSD trading plan (07-09-2015).